French School prior to restoration. I have worked as a fine art conservator for 16 years. I was previously employed at the National Gallery of Canada and the Canadian Museum of Civilization, both in Ottawa. For fourteen years I worked at the prestigious Grassi Studio in New York City on some of the most important Old Master paintings still in private hands. Additionally, I was commissioned to treat major impressionist and contemporary paintings and was the conservator-advisor for Jeff Koons. 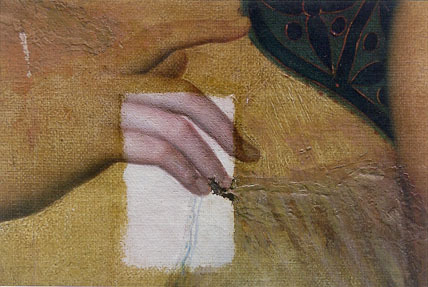 In our field, it is exceptional to have qualifications for and experience in both paintings and sculpture restoration. 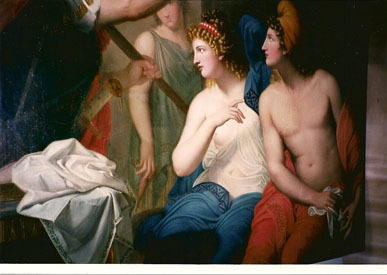 My background uniquely enables me to treat artworks such as polychrome sculptures, architectural decorations, and works in mixed media and materials. It also gives me an advantage in paintings restoration, especially when treatment requires lining and structural repair to stretchers or panel paintings. Having worked over a decade in one of the best equipped private conservation studios in the world, I have gained solid skills operating sophisticated equipment, including infrared (IR) Vidicon camera, Willard vacuum-hot table, and Gilardoni X-ray unit. Member of the International Institute for Conservation (IIC). Excellent references. Free examination and estimate. MA in Sculpture and Stone Conservation (Fine Art Academy, Budapest). 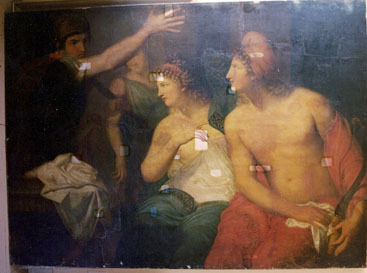 MA in Paintings Conservation (Queen's University, Canada). Links: If you would like to link with this page please email me.